There were just too many memories made at Amara’s 8th Birthday and Slumber Party to capture all in one post so I decided to split them up. I hope you enjoy her party as much as we did. Jenna and Justin had worked hard in advance to make the party a huge success. They got to our house early to do lots of decorating and to get the food and beverages all ready. Jenna had made a beautiful pitcher of lemonade with fresh cut lemons and maraschino cherries in it. It looked and tasted fabulous but the best part was the ice she had made. 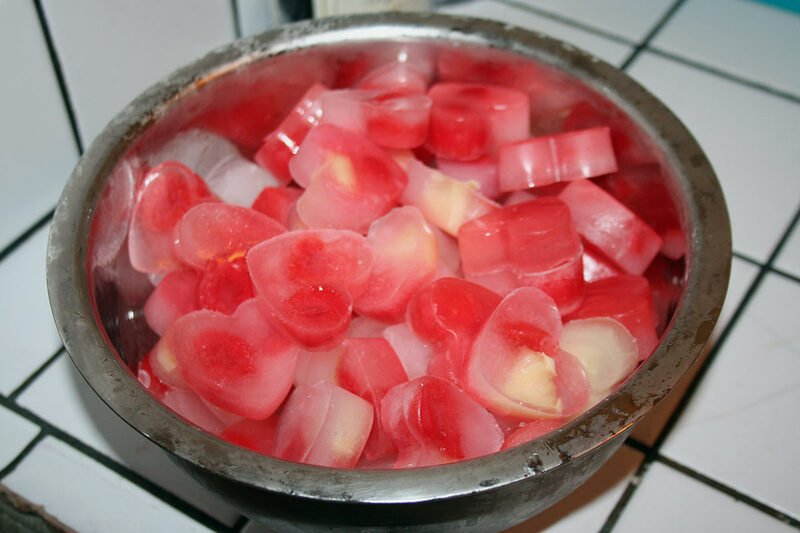 She had used small flexible cupcake hearts to freeze the ice cube, each one had a piece of lemon and a cherry inside it, and instead of water, she had used lemonade so it would not get watered down! How smart is my girl? While she got things ready in the kitchen Amara and Justin blew up the balloons and hung the crepe paper. It was going to be a fabulous party. As each girl arrived, Amara showed them her room here and helped them stow their sleeping bags. Then they went out in the backyard to play on the swing set and wait for the next girl. We had perfect southern California weather. We always have great weather on Amara’s birthday. Since she was having a slumber party, her Mom and Dad had decided not to get a bouncy house this year. 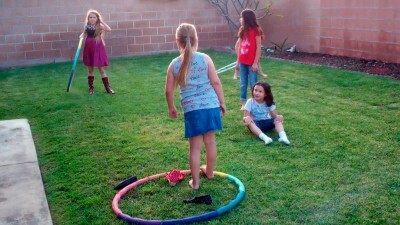 That meant they had lots of extra room in the backyard for things like hula hooping and jumping rope. They worked up big appetites waiting for the pizza to be delivered. They all sat around on the floor eating their pizza, drinking their lemonade, and discussing who was going to fall asleep first. Unfortunately, during pizza one of the girls came down with a very bad stomachache and had to go home. We sure hope she is feeling better. Pizza was followed by the most yummy birthday cake that Jenna had made. They have always gotten a big birthday cake from ABC Cakes but since there weren’t going to be so many of us this year Amara wanted her Mommy to make the cake. All of the girls raved that it was the best cake they had ever had — made better by the vanilla and chocolate ice cream. The time flew by and one of the Moms arrived to pick up her daughter who was not spending the night with us. We hated to see her go and she was sad when it was time to leave. We used her departure to wrap up the fashion session and to wash faces before the girls crawled into their sleeping bags to watch a little Wallace and Gromit and get ready for sleep. They looked so cute all lying across the front room floor. Grampy and I watched the end of Wallace and Gromit with them and then we went off to bed. I knew the cats were going to be very unhappy about not having the house to themselves. It is one thing for Amara to come and visit but she was bringing lots of other people with her this time! So in getting the house ready I had taken Twursula’s favorite blanket off of Amara’s bed and put it on the floor in our room. I woke up a couple of times that night and looked down to see her sleeping there. Twiggy slept on our bed all night, and Shebee was nowhere to be found. I will back with more on Amara’s 8th Birthday and the wonderful adventures from Saturday so be sure to stop back. This memory was posted in Special Occasions and tagged Amara, birthday, fashion, slumber party on April 22, 2012 by Grandma Kc. It sounds like it was so much fun!!! The girls look so cute all lined up with their sleeping bags! With all the planning and love that went into this party, I’m sure it was a memorable night for everyone! Good job Mommy & Daddy and Grama & Grampy!! Thanks for sharing that awesome idea for lemonade too, Grama Kc! I can’t wait to try that!! It’s such a delightful age! Looks like a fun party. I really like the heart ice cube idea. I have to look for those molds. Happy Birthday Amara! What a fabulous family and such sweet friends. I have such fond memories of slumber parties, but I never had one at my grandmother’s house. What a fun memory for Amara! Thanks for sharing. What a splendid (and fashionable!) evening for all. 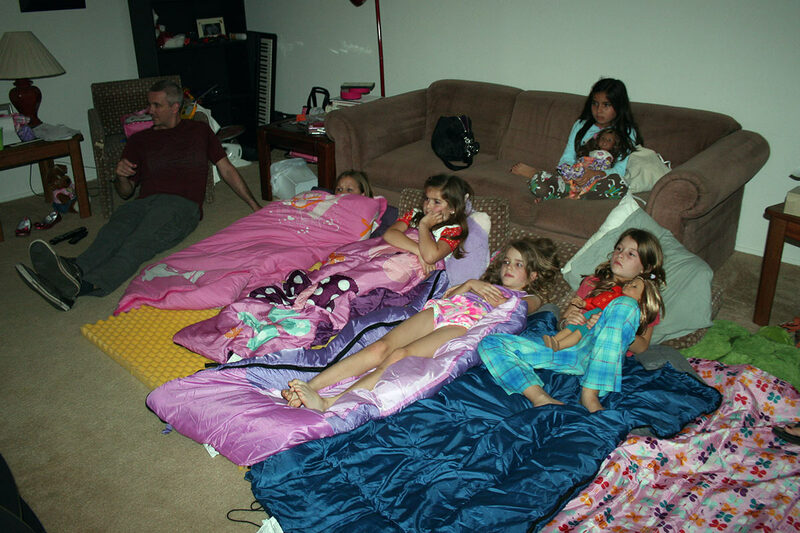 Slumber parties are some of the very best memories. You’re so awesome for hosting. And that ice? Definitely a great idea. Looks like all turned out fantastic! Again, happy EIGHTH birthday, Amara! Those girlies all in a row remind me of the prom breakfasts I would host and all the kids would come after prom and sleep- wall to wall. You were brave to host a sleepover. So glad it was a happy time for all. What a fun time for all! And what a grand idea with the frozen hearts. Too cute and very special! I do so love cherries! Thanks for the great ideas. I really love that ice cube idea! Usable for any holiday! Amara’s party was perfect for girls of her age…you didn’t miss a thing! Make up, pizza, outside games and a long happy row of sleeping bags full of cute little girls! Brings back memories of slumber parties I attended when young ! 🙂 The ice cube idea was great! Love this last pic with them all laying in sleeping bags and blankets! Such a universal, classic kind of gal pal gathering. How special for Amara to have this great intro to forever fun with girlfriends! They do love make up at this age, I know! Sounds like a perfect party for your perfect little angel! I look forward to the rest of the story! It won’t be long until we are having fashions shows and makeup at our oldest girls over night parties. Time flies doesn’t it? I am wondering how your cats reacted? Did they hide? 😉 Thanks for linking with me.